In the early 1970s, fresh out of college and living in San Francisco, I was working at a job I didn’t much like. On Monday mornings I would wake up with a queasy stomach, dreading the week ahead. Soon it occurred to me that, because I was living in the inner Richmond and working in the outer Sunset, I could bicycle to work through Golden Gate Park. This proved to be the perfect antidote to Monday morning blues. After a half hour of pedaling through the calm, green, fog-shrouded park, I would arrive at work feeling peaceful and prepared to face the day’s challenges. Thanks to this routine I learned the park’s landscape, followed its undulating topography, discovered hidden gems. Observing seasonal changes, plants and birds, the rhythm of the gardeners mowing, pruning and planting, I began to wonder about the park’s history, the folks who took care of it, the intricacies of its daily administration . . . and to fantasize about working there, instead of in the job I so disliked! Now living in San Francisco, after years of living elsewhere, I am so delighted to be able to explore this great park again, with a renewed sense of discovery and a deeper appreciation of its history and ecology. My mission in this blog is simply to celebrate the park, to tell its stories (past and present), learn more about it, talk with people who run it and use it, share what I discover. I hope you will join me on this journey and contribute stories of your own about the park, via comments on the blog. For most of my childhood in the 40’s & 50’s I would walk at early dawn from the Sunset District to the Richmond on my way to school, after my early morning paper route. There wasn’t a soul around and the park was shrouded with patches of dense fog and complete silence. I’d enter at 19th Ave. and take a different path (or make one) almost every day. Those were, indeed, “mysterious paths” — magical and marvelous journeys for a small boy. Every few days I’d make a left turn somewhere in the middle of the park and wind up walking to the beach instead of showing up in class. I do believe my walks through the park taught me as much as I ever learned in school, Certainly that was where I learned to use my imagination and keep it fresh for the remainder of my life. 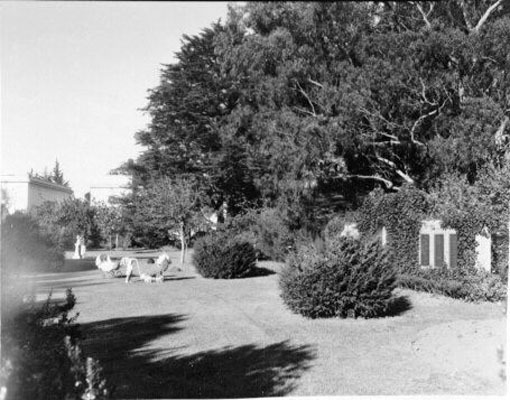 Does anyone have/know of photos of the Shakespere Garden before it was “cleaned up”.? It was one of my favorite haunts. In those days it was completely untended and grew in great tangles of bramble and dense shrubbery. 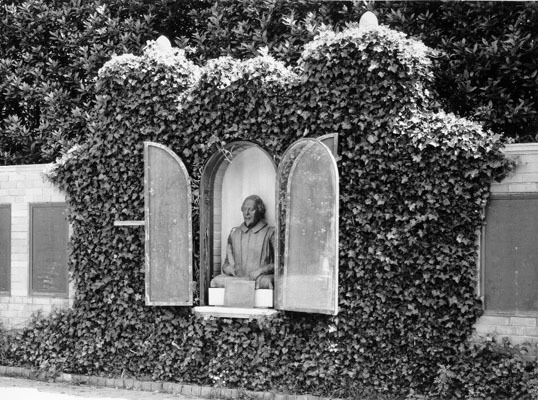 It may have been before the bust of Shakespere was locked up, I don’t really know. True to McLaren’s original vision, it was completely overgrown then and hidden from view. I’m sorry they decided to clean it up, I liked it best when it was at its wildest, forgotten and unmanicured. My biggest shock in the park is whenever I see the statue of McLaren by the rhododendrons, I still regard it as the ultimate insult to the memory of the man who gave us such natural beauty and hated the statues and monuments that marred it. 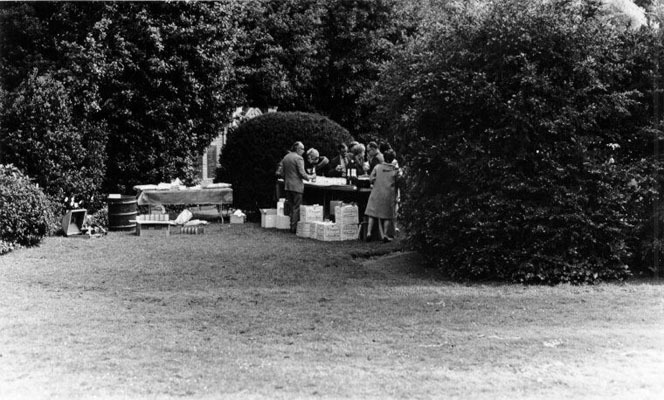 Well, please let me know if you can find any photos of the old Shakespere garden as it was for many years. much obliged. Many thanks for hunting down the images. Very interesting, especially the 1934 photo. Ah, hah! My childhood memories, it would seem, are faulty. The glass doors to the Shakespeare garden are closed & locked. for recovery. Benign neglect born in times of tight money . to feed it to the hungry Shakespearean flora. with large drops of rain. out across the forest green of unkempt lawn. of wholly purpled leaf, awash and gone! Since you had a career as an academic landscape architect, I assume you are a member of ASLA and a subscriber to Landscape Architecture Magazine. If I am correct in that assumption, I wonder if you saw the article about blue gum eucalyptus in the February 2015 issue? It seems there is much truth in the article, some untruth (though probably not intentional), and some exaggeration. Your opinion of that article would be helpful. Dear Million Trees. Sorry, I haven’t seen the article you are referring to. I’m a lapsed member of the ASLA and I don’t keep up with Landscape Architecture Magazine much any more. Perhaps you can provide a brief synopsis of the article and point out the parts that you think are untrue or exaggerated?